By admin , in Plantar Fasciitis on January 20, 2019 . 2 How do orthotics help? 3 What types of orthotics are there? 4 What type will I need? 5 What are orthotics made of? 6 Where do I get orthotics for plantar fasciitis? 7 What are the best types of orthotics? 8 What do I need to look for? Orthotics are orthopedic devices that are used to support or correct the alignment and function of a part of the body. Orthotics for plantar fasciitis are designed to support the plantar fascia (the ligament which supports the arch of the foot), hold the foot in alignment, cushion the heel and support the foot and ankle in the correct position to allow for standing, walking and running without pain. Orthotics take the pressure off the ligament, the plantar fascia, that supports the arch of the foot while cushioning the foot through shock absorption. For plantar fasciitis treatment and prevention, the device needs to support the arch of the foot while preventing the ligament from over-stretching, correct any misalignment in the foot or the gait, reduce weight-bearing on the heel to relieve pain and provide cushioning and support for the foot. Orthotics for plantar fasciitis allow people to be able to continue with their jobs, exercise, sports and everyday activities without the debilitating pain that often comes with the inflammation of the ligament. In many cases, they are the best means of treatment and preventing recurrences of the condition, by providing a drug-free, ongoing solution to heel pain. There are different orthotic appliances that can be used in the treatment and prevention of plantar fasciitis. The simplest form is a generic arch support and/or heel cushion that can be placed inside any shoe; these are available at pharmacies and health stores. Then there are specialist arch and heel supports available from podiatrists and full custom-made shoes or inserts that have been designed specifically for the individual. Other plantar fasciitis orthotics include heel cushioning or support, night braces and other corrective devices that hold the foot in a flexed position, commonly called plantar fasciitis socks. What type will I need? The type of orthotic needed will be dependant on the severity and longevity of the individual patient’s condition. Some people may only need to ensure they always wear well-fitting shoes with an arch support; some may need to wear a night brace or sock for a few months; others may need to have customized orthotic shoes for everyday wear. One of the most common type of orthotics is a shoe insert or insole that may be cover the whole sole or part of it. A variety of materials can be used, some are rigid and others are flexible. Common materials include plastic, rubber and, more recently, gel-filled orthotics. The material needs to be firm enough to be supportive yet flexible enough to allow for movement, except in the case of night splints. Shoes and inserts need to have shock-absorbing properties to reduce the force of impact when the foot strikes the ground when running and walking. Where do I get orthotics for plantar fasciitis? 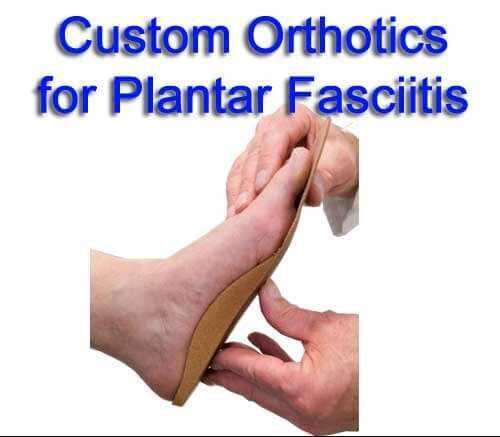 Healthcare professionals who are specialists in plantar fasciitis orthotics, known as orthotists or pedorthists, are trained in a range of sciences to enable them to diagnose and prescribe orthotics for patients. Podiatrists are able to recommend generic orthotics to give pain relief and prescribe individual orthotics. There are also specialty sports and shoe stores that have trained staff able to advise in the fitting of plantar fasciitis shoes for various sports and conditions. What are the best types of orthotics? Choice of the best orthotics is very much an individual thing, based on the individual misalignment of the foot, the severity of the condition, the age and weight of the person and the type of work, activity and sports engaged in. An inexpensive orthotic is a generic arch support, available from health and drug stores. Gel-filled orthotics are good because they mold to the shape of the individual foot. These may be good to try first as many people find that they give sufficient support to enable them to function without pain. 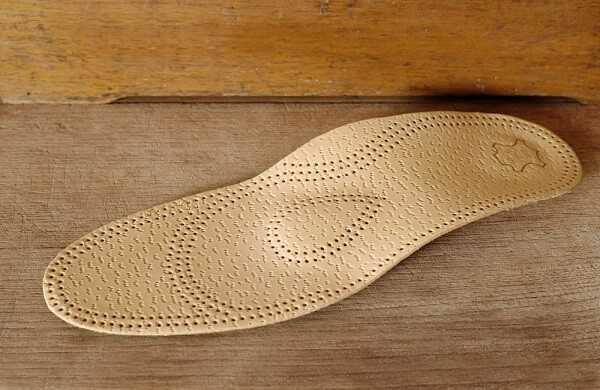 Soft insoles are meant to be comfortable, but not supportive, so make sure you get inserts with arch support. Make sure you wear the same support in both shoes to prevent creating a new set of problems. You may need to try different brands before you find the best orthotic shoe insert for your situation. If you find that you get no relief, or insufficient relief, using these generic orthotics, you may need to consult a podiatrist who will be able to prescribe an orthotic suited to your particular condition. This is a more expensive option, so check to see how much you are covered with your health insurance so you know, in advance, how much it is likely to cost you. While orthotics for plantar fasciits offer heel and arch support and relief from pain, the best results are usually obtained when using them in conjunction with other methods of treatment. Help yourself to a life free from heel pain by incorporating exercises and stretches into your daily routine, rest when needed and varying the ways you exercise.